The Dow Jones Industrial Average provides us with some pretty strong evidence that our “stock market boom” has been fueled by debt. On Wednesday, the Dow crossed the 20,000 mark for the first time ever, and this comes at a time when the U.S. national debt is right on the verge of hitting 20 trillion dollars. Is this just a coincidence? As you will see, there has been a very close correlation between the national debt and the Dow Jones Industrial Average for a very long time. During the Clinton years the Dow raced out ahead of the national debt, but an “adjustment” during the Bush years brought things back into line. The cold hard truth is that we have been living way above our means for decades. Our “prosperity” has been fueled by the greatest debt binge in the history of the world, and we are greatly fooling ourselves if we think otherwise. 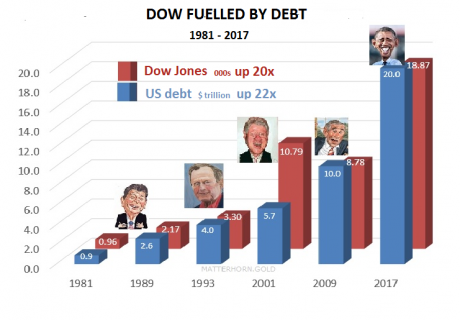 We would never have gotten to 20,000 on the Dow if Barack Obama and Congress had not gotten us into an extra 9.3 trillion dollars of debt over the past eight years. The average began tracking the most powerful corporate stocks in 1896, and has served as a broad measure of the market’s health through 22 presidents, 22 recessions, a Great Depression, at least two crashes and innumerable rallies, corrections, bull and bear markets. The blue chip reading finally cracked the 20,000 benchmark for the first time early Wednesday. During the current bull market, the second longest in history, the Dow has more than tripled since March 2009. Since Donald Trump’s surprise election victory, the Dow has now climbed by approximately 2150 points. And it took just 64 calendar days for the Dow to go from 19,000 to 20,000. That is an astounding pace, and financial markets around the rest of the planet are doing very well right now too. In fact, global stocks rose to a 19 month high on Wednesday. Well, if Donald Trump wants to see Dow 30,000 during his presidency, then history tells us that he needs to take us to 30 trillion dollars in debt. Of course that would be absolute insanity even if it was somehow possible. Each additional dollar of debt destroys the future of our country just a little bit more, and at some point this colossal bubble is going to burst. My hope is that the market will continue to go up. But nobody can deny that valuations are already at absurdly high levels, and the only way that this party can keep going is to continue to fuel it with more and more debt. CNBC looked at market data from the past 30 years and zeroed in on the times when the Dow has crossed levels like 2,000, 3,000, 4,000 … all the way up to the 19,000 level it hit in November. At those times, investors can typically expect traders to push it up even higher, according to data from Kensho. Not only does the Dow go up, but it outperforms the S&P 500 index along the way. The breakthrough came just four trading days into Trump’s presidency, a whirlwind in which the billionaire has reaffirmed his commitment to strengthen the U.S. economy and create more jobs and higher wages for workers. Still, nearly half of Americans have not benefited from the so-called “Trump Rally,” which has generated more than $2.2 trillion in paper gains for the Wilshire 5000 Total Stock Index since Election Day. The reason: only 52% of Americans polled by Gallup last April said they “have money invested in stocks” — the lowest stock ownership rate in the 19 years Gallup has tracked the data and down sharply from 65% in 2007 before the financial crisis. Hopefully the good times will continue to roll for as long as possible. But there is no possible way that they can keep going indefinitely. For decades, our debt has been growing much faster than our GDP has. By definition, this is an unsustainable situation. At some point we will have accumulated so much debt that our financial system will no longer be able to hold up under the strain. Many were convinced that we would reach that point before the U.S. national debt hit 20 trillion dollars, and yet here we are. So how much higher can we go before the bubble bursts? That is a very good question, and I don’t know if anyone has the right answer. But for President Trump, this is going to present him with quite a dilemma. Either he can keep the debt party going for as long as possible, or he can try to get us to take some tough financial medicine right now. If an attempt is made to deal with our debt problems now, we will experience severe economic pain almost immediately. But if the can keeps being kicked down the road, our long-term prognosis is just going to keep getting worse and worse. And if we try to delay the inevitable indefinitely, at some point the laws of economics are going to make our hard choices for us. So let us celebrate “Dow 20,000?, but let us also understand that it is far more likely that we will see “Dow 10,000? again before we ever see “Dow 30,000?.